Friedrich Wilhelm Christian Karl Ferdinand von Humboldt (/ˈhʌmboʊlt/; German: [ˈvɪlhɛlm fɔn ˈhʊmbɔlt]; 22 June 1767 – 8 April 1835) was a Prussian philosopher, linguist, government functionary, diplomat, and founder of the Humboldt University of Berlin, which was named after him in 1949 (and also after his younger brother, Alexander von Humboldt, a naturalist). He is especially remembered as a linguist who made important contributions to the philosophy of language, ethnolinguistics and to the theory and practice of education. In particular, he is widely recognized as having been the architect of the Humboldtian education ideal, which was used from the beginning in Prussia as a model for its system of education and eventually in countries such as the US and Japan. His younger brother, Alexander von Humboldt, was famous as a geographer, naturalist, and explorer. Humboldt was born in Potsdam, Margraviate of Brandenburg, and died in Tegel, Province of Brandenburg. In June 1791, he married Caroline von Dacheröden. They had eight children, of whom five (one of them Gabriele von Humboldt) survived to adulthood. Humboldt was a philosopher; he wrote The Limits of State Action in 1791–1792 (though it was not published until 1850, after Humboldt's death), one of the boldest defences of the liberties of the Enlightenment. It influenced John Stuart Mill's essay On Liberty through which von Humboldt's ideas became known in the English-speaking world. Humboldt outlined an early version of what Mill would later call the "harm principle". His house in Rome became a cultural hub, run by Caroline von Humboldt. The section dealing with education was published in the December 1792 issue of the Berlinische Monatsschrift under the title "On public state education". With this publication, Humboldt took part in the philosophical debate regarding the direction of national education that was in progress in Germany, as elsewhere, after the French Revolution. 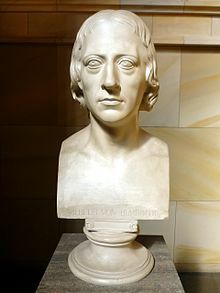 Humboldt had been home schooled and never finished his comparably short university studies at the universities of Frankfurt (Oder) and Göttingen. Nevertheless, he became one of the most influential officials in German education. Actually, Humboldt had intended to become Minister of education, but failed to attain that position. The Prussian King asked him to leave Rome in 1809 and to lead the directorate of education under Friedrich Ferdinand Alexander zu Dohna-Schlobitten. Humboldt did not reply to the appointment for several weeks and would have preferred to stay on at the embassy in Rome. His wife did not return with him to Prussia; the couple met again when Humboldt stepped down from the educational post and was appointed head of the Embassy in Vienna. Humboldt installed a standardized system of public instruction, from basic schools till secondary education, and founded Berlin University. He imposed a standardization of state examinations and inspections and created a special department within the ministry to oversee and design curricula, textbooks and learning aids. Humboldt's plans for reforming the Prussian school system were not published until long after his death, together with his fragment of a treatise on the 'Theory of Human Education', which he had written in about 1793. Here, Humboldt states that 'the ultimate task of our existence is to give the fullest possible content to the concept of humanity in our own person ... through the impact of actions in our own lives.' This task 'can only be implemented through the links established between ourselves as individuals and the world around us' (GS, I, p. 283). Humboldt's concept of education does not lend itself solely to individualistic interpretation. It is true that he always recognized the importance of the organization of individual life and the 'development of a wealth of individual forms' (GS, III, p. 358), but he stressed the fact that 'self-education can only be continued ... in the wider context of development of the world' (GS, VII, p. 33). In other words, the individual is not only entitled, but also obliged, to play his part in shaping the world around him. Humboldt's educational ideal was entirely coloured by social considerations. He never believed that the 'human race could culminate in the attainment of a general perfection conceived in abstract terms'. In 1789, he wrote in his diary that 'the education of the individual requires his incorporation into society and involves his links with society at large' (GS, XIV, p. 155). In his essay on the 'Theory of Human Education', he answered the question as to the 'demands which must be made of a nation, of an age and of the human race'. 'Education, truth and virtue' must be disseminated to such an extent that the 'concept of mankind' takes on a great and dignified form in each individual (GS, I, p. 284). However, this shall be achieved personally by each individual, who must 'absorb the great mass of material offered to him by the world around him and by his inner existence, using all the possibilities of his receptiveness; he must then reshape that material with all the energies of his own activity and appropriate it to himself so as to create an interaction between his own personality and nature in a most general, active and harmonious form' (GS, II, p. 117). Humboldt educational model goes beyond vocational training. In a letter to the Prussian king, he wrote: "There are undeniably certain kinds of knowledge that must be of a general nature and, more importantly, a certain cultivation of the mind and character that nobody can afford to be without. People obviously cannot be good craftworkers, merchants, soldiers or businessmen unless, regardless of their occupation, they are good, upstanding and – according to their condition – well-informed human beings and citizens. If this basis is laid through schooling, vocational skills are easily acquired later on, and a person is always free to move from one occupation to another, as so often happens in life." The philosopher Julian Nida-Rümelin criticized discrepancies between Humboldt's ideals and the contemporary European education policy, which narrowly understands education as a preparation for the labor market, and argued that we need to decide between McKinsey and Humboldt. As a successful diplomat between 1802 and 1819, Humboldt was plenipotentiary Prussian minister at Rome from 1802, ambassador at Vienna from 1812 during the closing struggles of the Napoleonic Wars, at the congress of Prague (1813) where he was instrumental in drawing Austria to ally with Prussia and Russia against France, a signer of the peace treaty at Paris and the treaty between Prussia and defeated Saxony (1815), at Frankfurt settling post-Napoleonic Germany, and at the congress at Aachen in 1818. However, the increasingly reactionary policy of the Prussian government made him give up political life in 1819; and from that time forward he devoted himself solely to literature and study. Wilhelm von Humboldt was an adept linguist and studied the Basque language. He translated Pindar and Aeschylus into German. Humboldt's work as a philologist in Basque has had more extensive impact than his other work. His visit to the Basque country resulted in Researches into the Early Inhabitants of Spain by the help of the Basque language (1821). In this work, Humboldt endeavored to show by examining geographical placenames that at one time a race or races speaking dialects allied to modern Basque extended throughout Spain, southern France and the Balearic Islands; he identified these people with the Iberians of classical writers, and further surmised that they had been allied with the Berbers of northern Africa. Humboldt's pioneering work has been superseded in its details by modern linguistics and archaeology, but is sometimes still uncritically followed even today. He was elected a member of the American Antiquarian Society in 1820, and a Foreign Honorary Member of the American Academy of Arts and Sciences in 1822. ... first clearly laid down that the character and structure of a language expresses the inner life and knowledge of its speakers, and that languages must differ from one another in the same way and to the same degree as those who use them. Sounds do not become words until a meaning has been put into them, and this meaning embodies the thought of a community. What Humboldt terms the inner form of a language is just that mode of denoting the relations between the parts of a sentence which reflects the manner in which a particular body of men regards the world about them. It is the task of the morphology of speech to distinguish the various ways in which languages differ from each other as regards their inner form, and to classify and arrange them accordingly. He is credited with being the first European linguist to identify human language as a rule-governed system, rather than just a collection of words and phrases paired with meanings. This idea is one of the foundations of Noam Chomsky's theory of language. Chomsky frequently quotes Humboldt's description of language as a system which "makes infinite use of finite means", meaning that an infinite number of sentences can be created using a finite number of grammatical rules. Humboldt scholar Tilman Borsche, however, notes profound differences between von Humboldt's view of language and Chomsky's. More recently, Humboldt has also been credited as an originator of the linguistic relativity hypothesis (more commonly known as the Sapir–Whorf hypothesis), developed by linguists Edward Sapir or Benjamin Whorf a century later. The reception of Humboldt's work remains problematic in English-speaking countries, despite the work of Langham Brown, Manchester and James W. Underhill (Humboldt, Worldview & Language, 2009), on account of his concept of what he called Weltansicht, the linguistic worldview, with Weltanschauung being translated simply as 'worldview', a term associated with ideologies and cultural mindsets in both German and English. The centrality of distinction in understanding Humboldt's work was set out by one of the leading contemporary German Humboldt scholars, Jürgen Trabant, in his works in both German and French. Polish linguists at the Lublin School (see Jerzy Bartmiński), in their research of Humboldt, also stress this distinction between the worldviews of a personal or political kind and the worldview that is implicit in language as a conceptual system. However, little rigorous research in English has gone into exploring the relationship between the linguistic worldview and the transformation and maintenance of this worldview by individual speakers. One notable exception is the work of Underhill, who explores comparative linguistic studies in both Creating Worldviews: Language, Ideology & Metaphor (2011) and in Ethnolinguistics and Cultural Concepts: Truth, Love, Hate & War (2012). In Underhill's work, a distinction is made between five forms of worldview: world-perceiving, world-conceiving, cultural mindset, personal world and perspective, in order to convey the distinctions Humboldt was concerned with preserving in his ethnolinguistics. Probably the best-known linguist working with a truly Humboldtian perspective writing in English today is Anna Wierzbicka, who has published a number of comparative works on semantic universals and conceptual distinctions in language. The Rouen Ethnolinguistics Project, in France, published online a 7-hour series of lectures on Humboldt's thought on language, with the Berlin specialist Prof. Trabant. In Charles Taylor's important summative work, The Language Animal: The Full Shape of the Human Linguistic Capacity, (Taylor, 2016) von Humboldt is given credit, along with Johann Georg Hamann and Johann Gottfried Herder, for inspiring Taylor's "HHH" approach to the philosophy of language, emphasizing the creative power and cultural specificity of language. The Eighteenth Century (orig. Das achtzehnte Jahrhundert). = 1797. Ästhetische Versuche I. – Ueber Göthes Herrmann und Dorothea. 1799. Ueber das vergleichende Sprachstudium in Beziehung auf die verschiedenen Epochen der Sprachentwicklung. 1820. Ueber die Aufgabe des Geschichtsschreibers. 1821. Ueber die Entstehung der grammatischen Formen und ihren Einfluss auf die Ideenentwicklung. 1822. Upon Writing and its Relation to Speech (orig. Ueber die Buchstabenschrift und ihren Zusammenhang mit dem Sprachbau). 1824. Notice sur la grammaire japonaise du P. Oyanguren (1826), read online. Ueber die unter dem Namen Bhagavad-Gítá bekannte Episode des Mahá-Bhárata. 1826. On Schiller and the Path of Spiritual Development (orig. Ueber Schiller und den Gang seiner Geistesentwicklung). 1830. ^ Philip A. Luelsdorff, Jarmila Panevová, Petr Sgall (eds. ), Praguiana, 1945–1990, John Benjamins Publishing, 1994, p. 150: "Humboldt himself (Humboldt was one of the leading spirits of romantic linguistics; he died in 1834) emphasized that speaking was permanent creation." ^ David Kenosian: "Fichtean Elements in Wilhelm von Humboldt's Philosophy of Language", in: Daniel Breazeale, Tom Rockmore (ed. ), Fichte, German Idealism, and Early Romanticism, Rodopi, 2010, p. 357. ^ a b Jürgen Georg Backhaus (ed. ), The University According to Humboldt: History, Policy, and Future Possibilities, Springer, 2015, p. 58. ^ "Humboldt". Random House Webster's Unabridged Dictionary. ^ "Wilhelm - Französisch-Übersetzung - Langenscheidt Deutsch-Französisch Wörterbuch" (in German and French). Langenscheidt. Retrieved 20 October 2018. ^ "Duden | von | Rechtschreibung, Bedeutung, Definition, Synonyme, Herkunft". Duden (in German). Retrieved 20 October 2018. ^ Hermann Klencke, Gustav Schlesier, Lives of the brothers Humboldt, Alexander and William New York, 1853:13. ^ Manfred Geier: Die Brüder Humboldt. Reinbek bei Hamburg 2009, pp. 261 ff. ^ Clark, Christopher (2006). Iron Kingdom: The Rise and Downfall of Prussia. United States of America: Penguin Group. p. 332. ^ "Book of Members, 1780–2010: Chapter H" (PDF). American Academy of Arts and Sciences. Retrieved 7 August 2014. ^ Muriel Mirak Weissbach (1999). "Wilhelm von Humboldt's Study of the Kawi Language: The Proof of the Existence Of the Malayan-Polynesian Language Culture". Fidelio Magazine. VIII (1). Archived from the original on 12 July 2014. ^ see Tilman Borsche: Sprachansichten. Der Begriff der menschlichen Rede in der Sprachphilosophie Wilhelm von Humboldts, Stuttgart: Klett-Cotta, 1981. ^ The Jurgen Trabant Wilhelm von Humboldt Lectures, launched by the Rouen University Ethnolinguistics Project. ^ Taylor, Charles (2016) The Language Animal: The Full Shape of the Human Linguistic Capacity. Cambridge, MA: Harvard University Press. Azurmendi, Joxe. Humboldt. Hizkuntza eta pentsamendua, Bilbo, UEU, 2007. ISBN 978-84-8438-099-3. * Forster, Michael N. German Philosophy of Language: From Schlegel to Hegel and Beyond, Oxford, Oxford University Press, 2011. ISBN 978-0-19-960481-4. Berman, Antoine. L'épreuve de l'étranger. Culture et traduction dans l'Allemagne romantique: Herder, Goethe, Schlegel, Novalis, Humboldt, Schleiermacher, Hölderlin, Paris, Gallimard, Essais, 1984. ISBN 978-2-07-070076-9. Borsche, Tilman. Wilhelm von Humboldt, München, Beck, 1990. ISBN 3-406-33218-8. Doerig, Detmar (2008). "Humboldt, Wilhelm von (1767–1835)". In Hamowy, Ronald. The Encyclopedia of Libertarianism. Thousand Oaks, CA: SAGE; Cato Institute. pp. 229–30. doi:10.4135/9781412965811.n141. ISBN 978-1-4129-6580-4. LCCN 2008009151. OCLC 750831024. Hegel, G. W. F., 1827. On The Episode of the Mahabharata Known by the Name Bhagavad-Gita (Hegel's review of Wilhelm von Humboldt's lectures on the Bhagavad-Gita). Lalatta Costerbosa, Marina. Ragione e tradizione: il pensiero giuridico ed etico-politico di Wilhelm von Humboldt, Milano, Giuffrè, 2000. ISBN, 88-14-08219-7. Marra, Realino. La ragione e il caso. Il processo costituente nel realismo storico di Wilhelm von Humboldt, «Materiali per una storia della cultura giuridica», XXXII–2, 2002, pp. 453–64. Schultheis, Franz. Le cauchemar de Humboldt: les réformes de l'enseignement supérieur européen, Paris, Raisons d'agir éditions, 2008. ISBN 978-2-912107-40-4. Sorkin, David. "Wilhelm Von Humboldt: The Theory and Practice of Self-Formation (Bildung), 1791–1810" in: Journal of the History of Ideas, Vol. 44, No. 1 (Jan.–Mar., 1983), pp. 55–73. Trabant, Jürgen. « Humboldt ou le sens du language », Mardaga, 1995. * Stubb, Elsina. Wilhelm Von Humboldt's Philosophy of Language, Its Sources and Influence, Edwin Mellen Press, 2002. Trabant, Jürgen. « Sprachsinn: le sens du langage, de la linguistique et de la philosophie du langage » in La pensée dans la langue. Humboldt et après, P.U.V., 1995. Trabant, Jürgen. « Traditions de Humboldt, Éditions de la Maison des Sciences de l'homme », Paris, 1999. Underhill, James W. Humboldt, Worldview and Language, Edinburgh, Edinburgh University Press, 2009. Underhill, James W. Ethnolinguistics and Cultural Concepts: truth, love, hate & war, Cambridge, Cambridge University Press, 2012. Valentin, Jean-Marie. Alexander von Humboldt: 150e anniversaire de sa mort, Paris, Didier Érudition. 2011. ISBN 978-2-252-03756-0. Wikimedia Commons has media related to Wilhelm von Humboldt. Mueller-Vollmer, Kurt. "Wilhelm von Humboldt". In Zalta, Edward N. Stanford Encyclopedia of Philosophy. Thinking Language: Wilhelm von Humboldt Now Event Videos, Conference Papers recorded at Queen Mary University of London, April 2016, organiser Marko Pajević. Papers on Humboldt's "thinking language" by Marko Pajevic, John Joseph, Jürgen Trabant, Ute Tintemann, Barbara Cassin (presented by David Nowell Smith), James W. Underhill, John Walker.